NEW YORK, Oct. 1, 2015 – The first industry manufacturer to join the fight against breast cancer in a meaningful, tangible way, GROHE America, a division of the GROHE Group, the world’s leading provider of sanitary fittings for kitchens and baths, is a committed partner of the Breast Cancer Research Foundation (BCRF), the highly regarded breast cancer nonprofit. 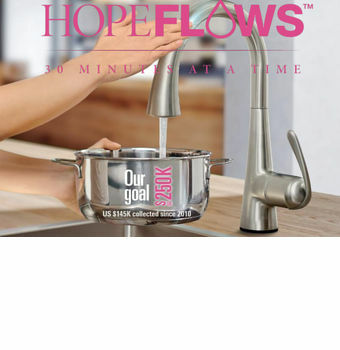 The company is launching its sixth HopeFlows™... 30 Minutes at a Time campaign during October, National Breast Cancer Awareness Month. With October online sales through participating retailers benefiting BCRF, the Minta® Touch, like the LadyLux3 Café Touch, can be operated by conventional lever operation or the flow of water can be triggered by skin contact with any part of the spout. 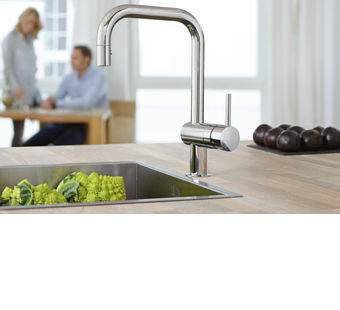 Featured is the L-spout design; a Cspout model is also offered. With each purchase of a GROHE Ladylux³ Café Touch faucet, Minta® Touch faucet and Euphoria® Shower System sold online from participating retailers between October 1st through October 31, 2015, GROHE will donate $25 to the BCRF to help find a cure for breast cancer. Purchases of every Rainshower® Next Generation Icon pink hand shower will sponsor an additional $10. 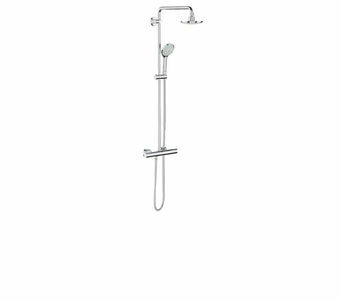 shower head and hand shower. Both showers present the luxurious GROHE Rain spray. “We are once again proud to partner with BCRF, which has a stellar record in identifying and funding the most advanced global research projects and are thankful for the enthusiastic support of our online partners,” says Cheryl Dixon, Head of Brand and Trade Marketing for GROHE America. offers a halo-shaped spray face that reduces the aesthetic volume and delivers a large full spray thanks to the perfectly aligned shower nozzles and GROHE DreamSpray®, advanced shower engines that provide efficient water distribution. Throughout the month of October, when you share your image or message of hope or inspiration and tag #grohehopeflows on Twitter or Instagram, GROHE will donate $1 to the Breast Cancer Research Foundation. The Breast Cancer Research Foundation (BCRF) is a nonproft organization committed to achieving prevention and a cure for breast cancer. It provides critical funding for cancer research worldwide to fuel advances in tumor biology, genetics, prevention, treatment, metastis and survivorship. Since its founding in 1993 by the late Evelyn H.Lauder, BCRF has raised more than half a billion dollars for lifesaving research. Through a unique and streamlined grants program, it seeks out the brightest minds in science and medicine and gives them the necessary resources to pursue their best ideas. As result, researchers are able to make discoveries and design new approaches to address all aspects of breast cancer – and do so in record time. For more information about the Breast Cancer Research Foundation, go to www.bcrfcure.org.